For those who want to watch Blu-ray movies on HDTV without a Blu-ray player, you’re in the right place. This post will list 2018 top-ranked Blu-ray to Smart TV converter for you guys. Brorsoft Blu-ray Ripper is one of the best Blu-ray to Smart TV converter that capable to remove all the restrictions like AAC, BD+, CSS, Region, RCE, Sony ARccOS and PuppetLock, as well as rip/backup 2D/3D/HD/4K Blu-ray discs to LG/Sony/Panasonic/Samsung/Vizio etc smart TV compatible video files in fast ripping speed and excellent output video quality. Plus, it has 150+ optimal presets for iPhone, iPad, Android, Samsung, HTC, Xbox, PS3/PS4. If you are running on Mac OS X, please turn to the equivalent Mac version entitled Brorsoft Blu-ray Ripper for Mac. Brorsoft Video Converter Ultimate is another reliable video converter that can fast convert any Blu-ray, DVD and common videos to Smart TV supported mp4, mkv video formats without losing quality. Quickly convert virtually any video/DVD/Blu-ray files to all popular video/audio formats like MOV, MP4, AVI, WMV, MKV, FLV, 3GP, VOB and more. Plus, it also provides 150+ optimized settings to fit your iPhone iPod, iPad, Apple TV, PSP, Xbox HTC, Samsung Galaxy Tab/Smartphones etc. If you’re running on a Mac, please turn to Brorsoft iMedia Converter for Mac. Step 1. Install and run the best Blu-ray to Smart TV converter, simply click the “load disc” button to load your Blu-ray movies into it. You can also load video_ts folders, ISO/IFO, DVD discs. At the bottom, you can select your desired subtitle and audio track. Step 2. Tap the format bar and you can see various devices and their supported formats. 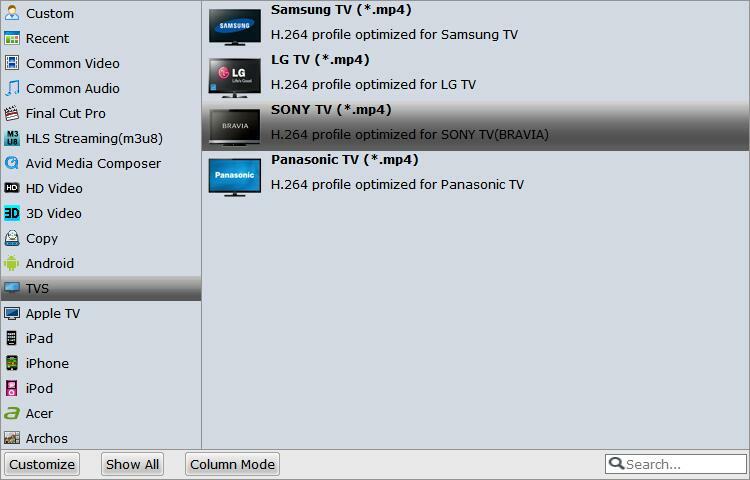 Here for Samsung/LG/Sony/Panasonic TVs, choose the preset like “TVS” ＞ “Sony TV(*.MP4)” as output format. Tips-Advanced: You can also set output video format as H.264 MP4 under Format > Common Video. In general, mp4 is a well-accepted file format for its ability to save memory storage and keep up the video quality. Step 3. Tap the “Convert” button at the bottom-right corner of the interface to rip/convert Blu-ray movies to your Smart TV. Once the conversion is finished, you will be able to get the output files for Smart TV via clicking on “Open” button effortlessly. Now you can smoothly play the converted Blu-ray movies on Smart TV via USB drive or home server a breeze. This entry was posted in Reviews and tagged best blu-ray to smart tv converter, convert blu-ray to smart tv, play blu-ray on smart tv without blu-ray player, rip blu-ray to smart tv. Bookmark the permalink. Good review, I have download the software,easy to use.